I love making cute origami projects. However, I am an origami newbie and I don't design my own projects. Today's tutorial was inspired by one I found on a Japanese website. (Which by the way.. I can't find the website right now. But when I find the link, I will be sure to put it up here!) The directions were all in Japanese and slightly more complicated. I cut out a lot of the extra folds for this simpler version! Note: I am an origami newbie, so yes, I use scissors and tape. But, I still consider this an origami project because we are mostly folding paper to create this mermaid! Grab a piece of skin colored paper. Place the white side up. 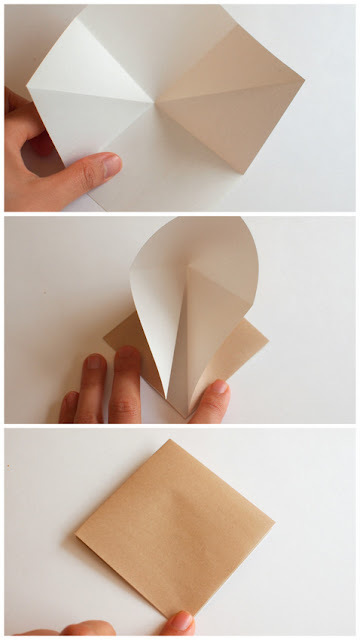 Fold your paper in half one way and unfold. Then, fold it in half the other way and unfold. Now flip the paper over so that the paper is brown/peach side up. (Mine doesn't look brown because of the bad lighting. Sorry! But it's brown.) 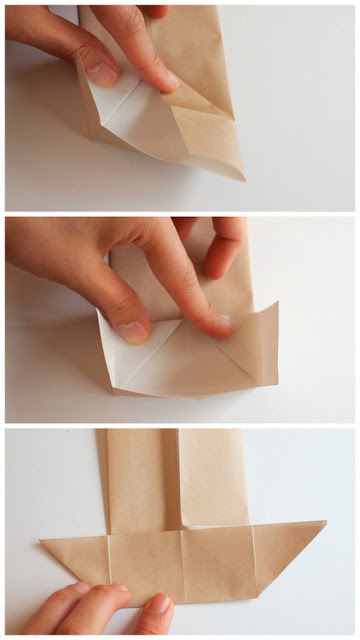 Now fold the paper in half diagonally. 3a. Now open up your fold and flip the paper back so the white side is up. 3b. and 3c. Your paper now has crease marks so that when it is pressed on both sides and flattened... it should close up to look like a square. 4a. Fold back the two top sides. 4b. Fold up the two back sides. (Now you have ears.) Fold the bottom back and you'll have a chin. Congrats! You've got a face! Let's make that mermaid's body! Grab a piece of skin colored paper. Place the paper white side up. Then, fold the paper in half one way and unfold. Then, fold it in half the other way and unfold. 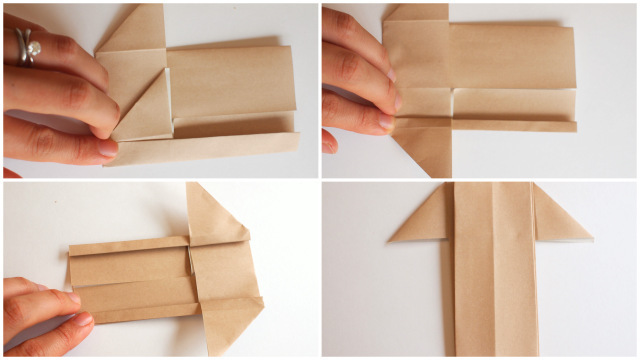 Fold up one side so that it meets one of your middle folds. 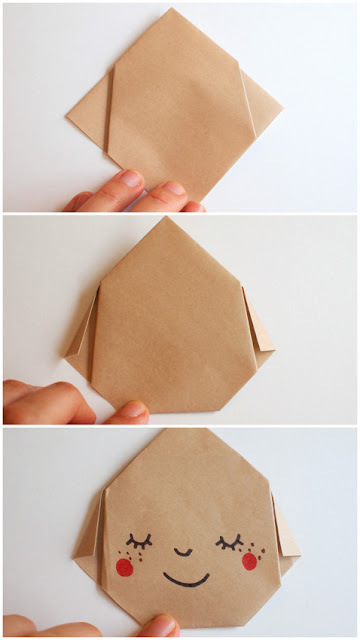 Now fold the left and right sides of your origami paper in so that they meet the middle. 5c. Press down to create arms. 6a. Slightly fold back one side. 6c. Do the same two folds to the other side of your body. 6d. Flip over your body. It should look like this. Congrats! You have a mermaid's body! Now let's fold a mermaid tail! 1a. Grab a piece of green paper. Place the paper white side up. Fold the right side over, leaving about a third uncovered. 1b. Fold the left side over so that the sides match. 1c. Fold the top corner down. 1d. Slip your top corner behind the other pieces. 2a. Fold the bottom tip upwards. 2b. Now fold the tip downwards. 2c. Flip your tail over to the front. 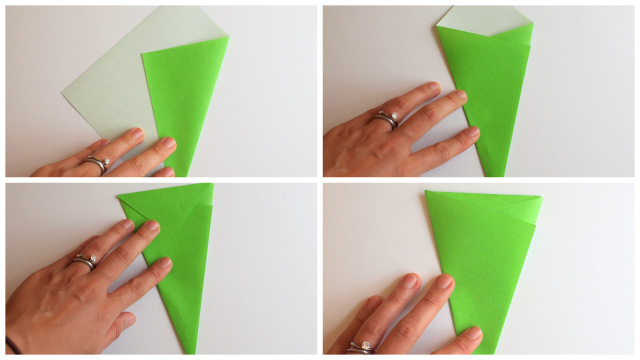 Grab a pair of scissors and cut along the fold to create two fins. 2d. This is what your fins will look like! This is what it will look like from the front. Now let's make some hair. See? Tape the head in there. Tape all your body parts together. Add more details with Sharpie marker. Congratulations! 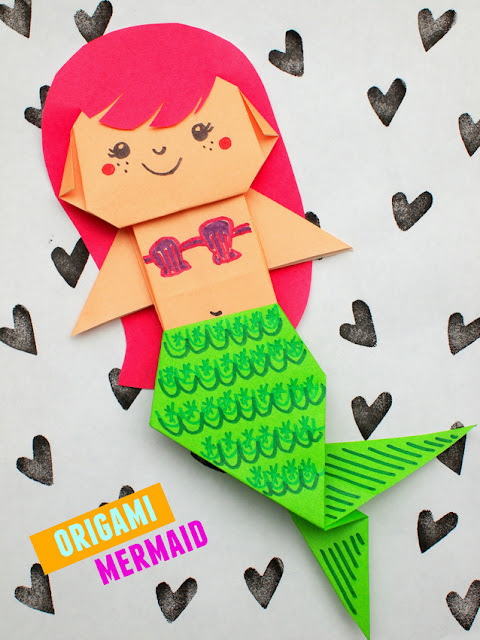 You've got yourself an origami mermaid! 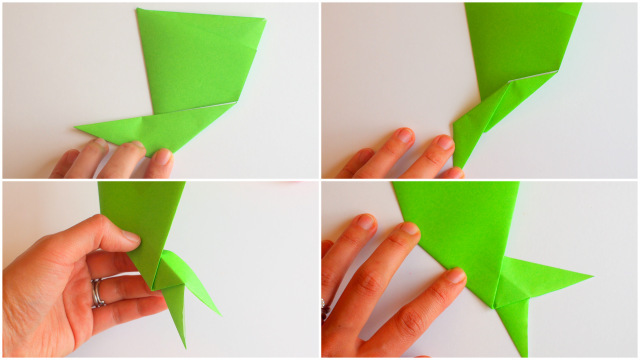 Grab your mermaid tails and flippers and I hope you enjoy making this origami craft with the kiddos! By the way- if you liked this craft, definitely check out my other origami projects and these toilet roll mermaid and hula girls. They're also uber cute and fun to make!